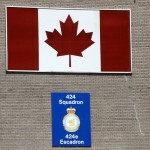 APD visits RCAF 424 Tiger Squadron at its Hangar 9 base at 8 Wing/CFB Trenton, Ontario. 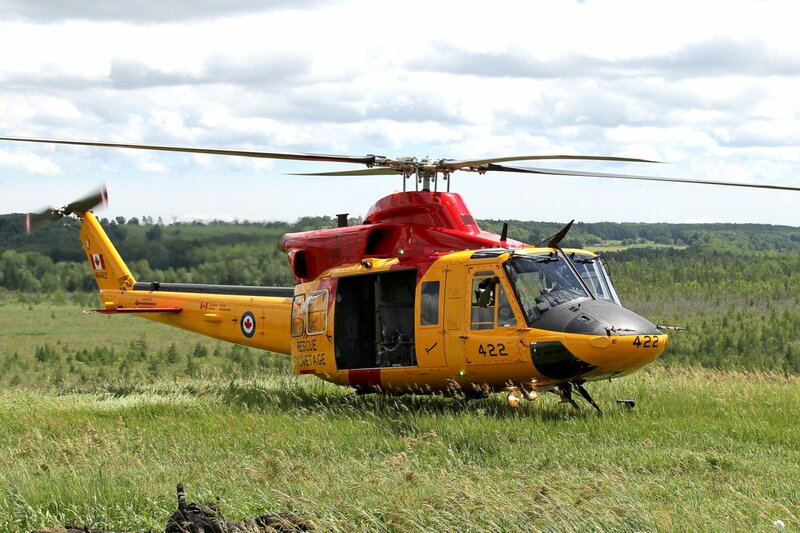 424 Transport and Rescue Squadron is mandated to respond to all aircraft incidents and all marine incidents in waters under federal jurisdiction and, although the provinces are responsible for ground SAR Missions, the Canadian Armed Forces may provide assistance to land and inland water rescues when possible. 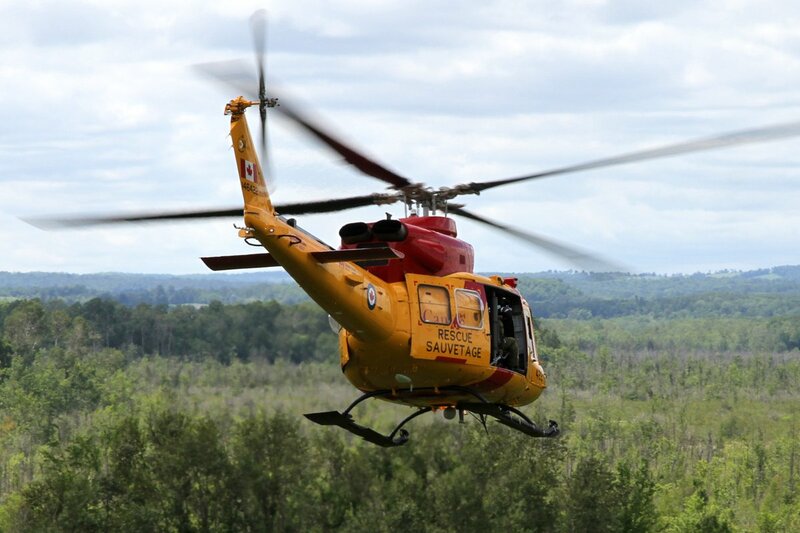 All SAR bases keep one helicopter and one fixed wing aircraft, dedicated to SAR response, ready and on standby 24/7. 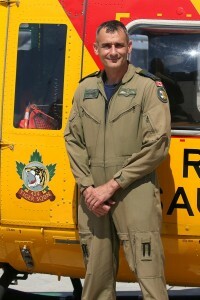 LCol Dany Poitras is CO of the RCAF 424 Tiger Squadron. Along with his command duties, he takes a regular shift as a CH-146 Griffon rescue pilot. 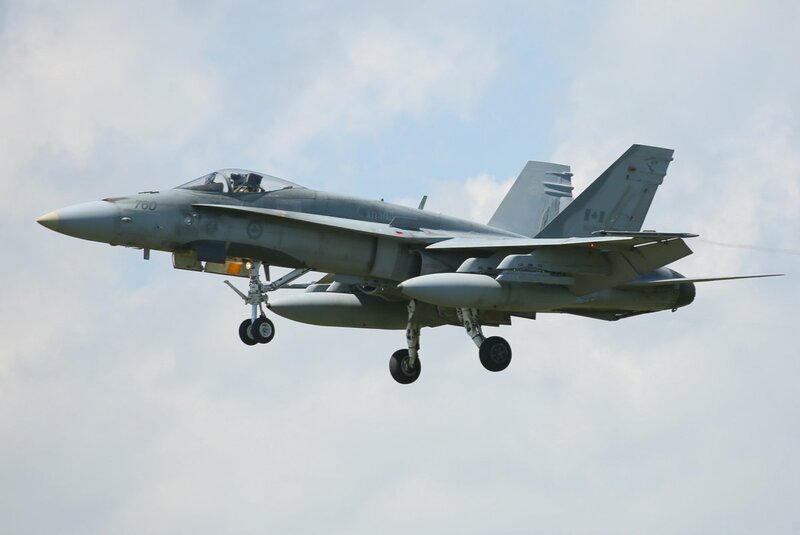 The largest Canadian Forces Base in Canada is found in one of the more picturesque areas of Southern Ontario and is located along the shores of the Bay of Quinte. Here, at 8 Wing/CFB Trenton, over 3,200 regular force, 600 reserve force and 500 civilian members make-up the workforce. 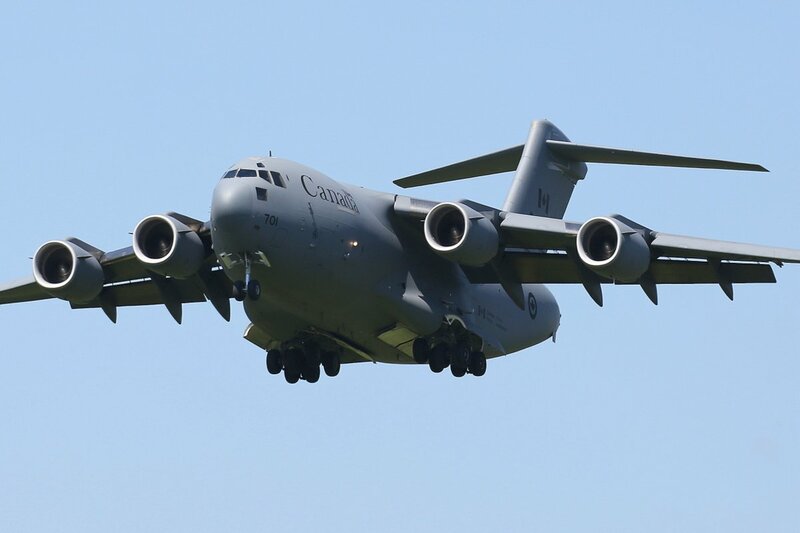 As the hub of air transport operations, 8 Wing is involved in virtually every Canadian Forces operation and most personnel and equipment deployed to any destination within Canada or around the world pass through CFB Trenton at some point. 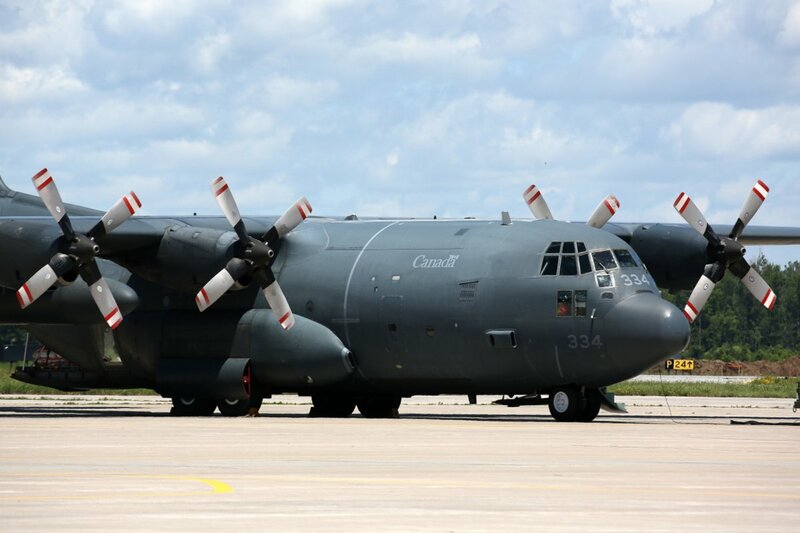 Along with its strategic and tactical airlift squadrons, CFB Trenton is also home to 424 Transport and Rescue Squadron (424 Tiger Squadron), flying CC-130E/H Hercules transport and CH-146 Griffon helicopters. 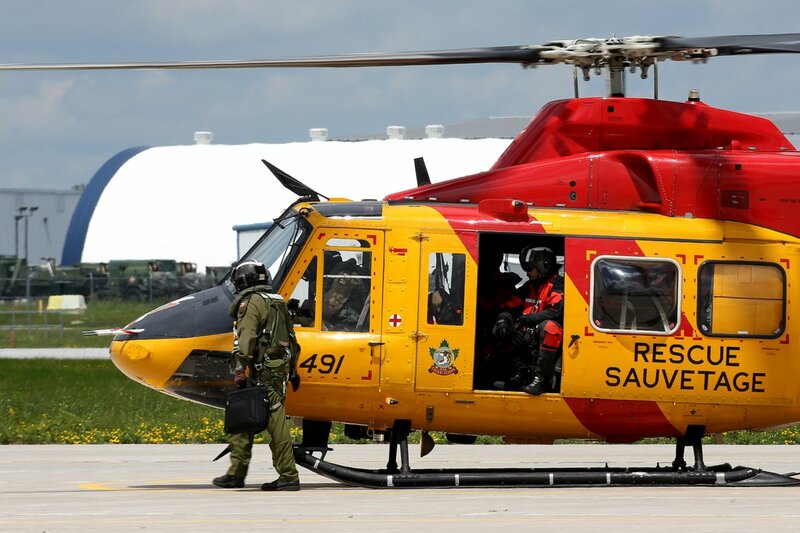 This SAR squadron, together with 435 Squadron out of 17 Wing, Winnipeg, is responsible for the 10,000,000 square km of the Trenton Search and Rescue Region (TSRR) that includes most of Quebec, all of Ontario, the Prairie Provinces and the entire Arctic. LCol. 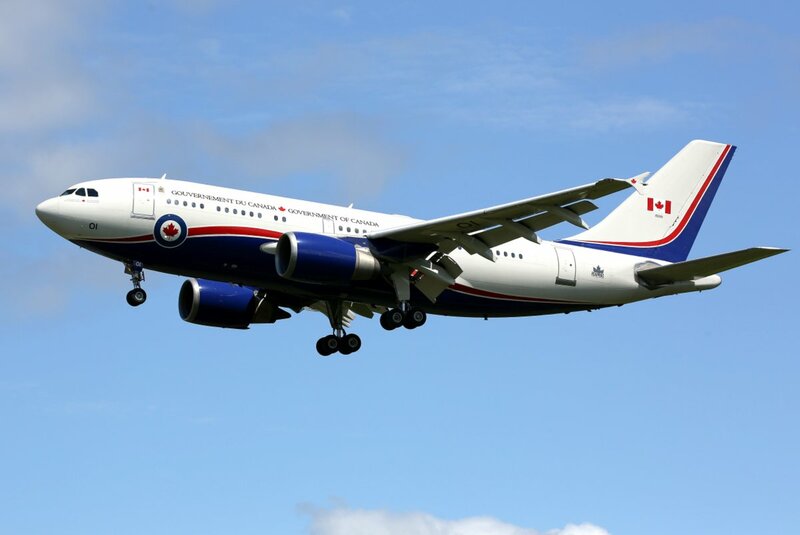 Dany Poitras, the Commanding Officer of 424 Tiger Squadron, identified this as one of his major challenges when he said, “The area and distances we are responsible for are enormous and most people don’t realize that CFB Trenton is closer to South America than it is to the Canadian High Arctic”. Last week, when APD was visiting 424 Tiger Squadron, the standby pilots had just sat down with their lunch trays when a call came from Joint Rescue Coordination Centre (Trenton) to inform them that a request had been received from the USCG in Buffalo NY for assistance in locating an unmanned boat on the US shoreline of Lake Ontario. 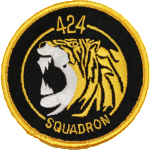 424 Squadron was tasked for this mission and the CH-146 Griffon crew of two pilots, a flight engineer and two SAR Techs had to be airborne within their mandated time of 30 minutes. 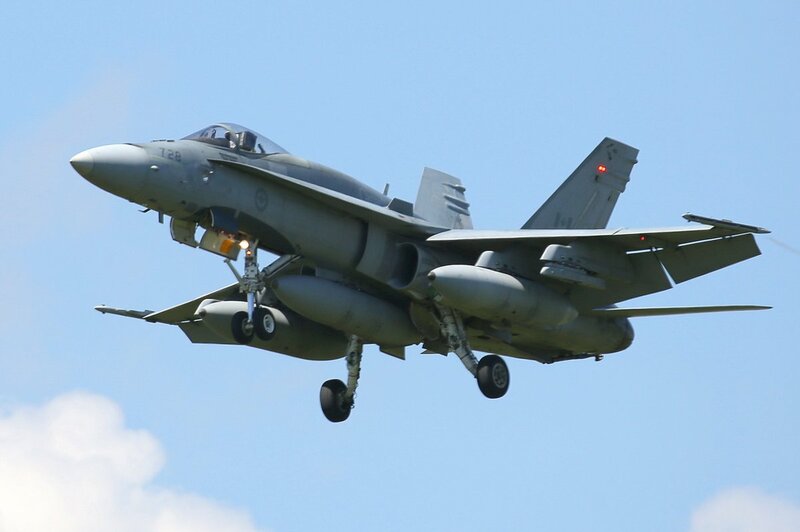 As LCol Poitras, a qualified Griffon pilot who flew this mission, mentioned, “This was a worst case scenario as we had to walk back to the flight line from the mess, cutting down on precious minutes”. 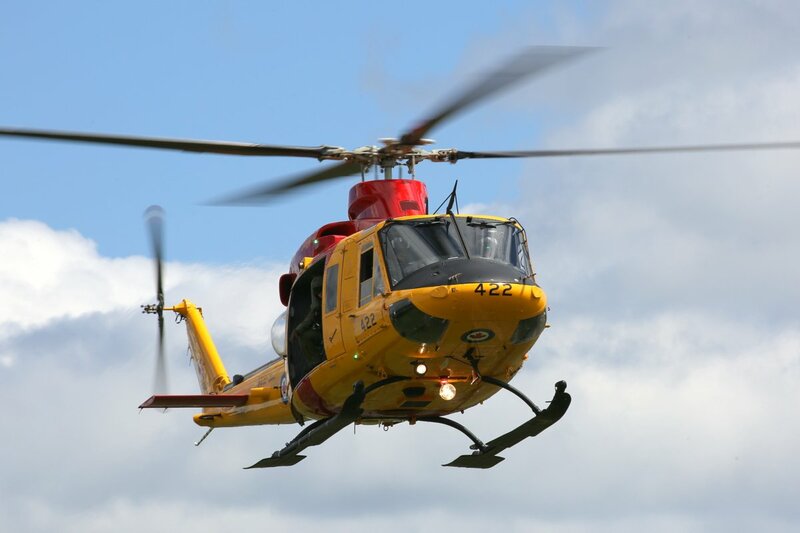 Needless to say, their CH-146 Griffon (146491) “Rescue 491” was airborne in 28 minutes with its SAR Techs and gear on board and, after crossing Lake Ontario, was on scene in 40 minutes. 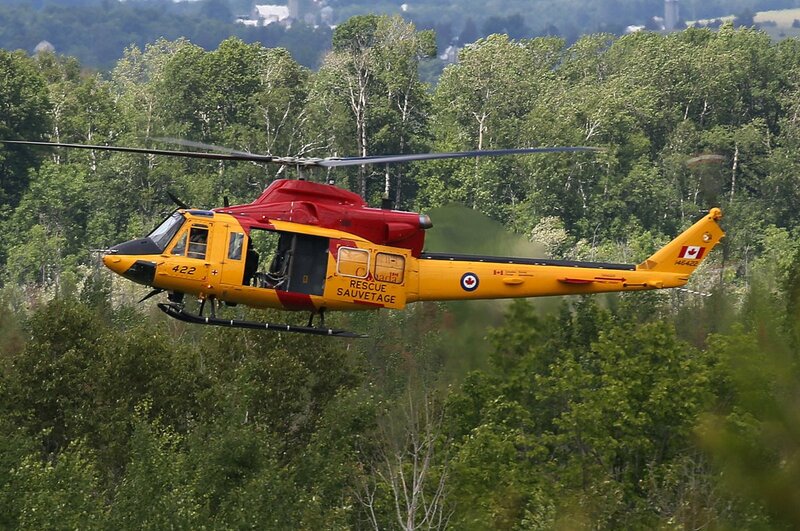 It was a testament to how seriously the men and women of 424 Tiger Squadron take their SAR role. 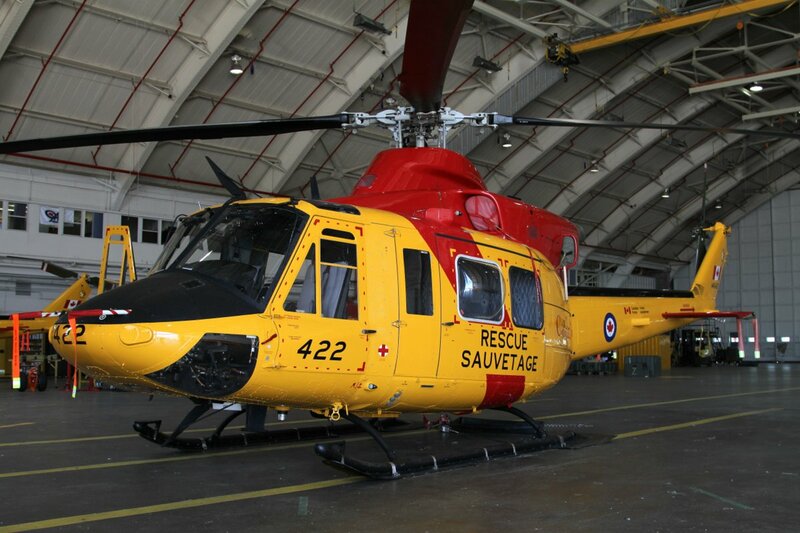 Pre-flight checks being completed 424 Tiger Squadron SAR Alert Bird CH-146 Griffon "Rescue 491". CH-146 Griffon "Rescue 491" is the 424 Tiger Squadron SAR Alert Bird and has just been tasked to provide assistance to USCG Station Buffalo.....it's airborne 28 minutes after receiving the call. 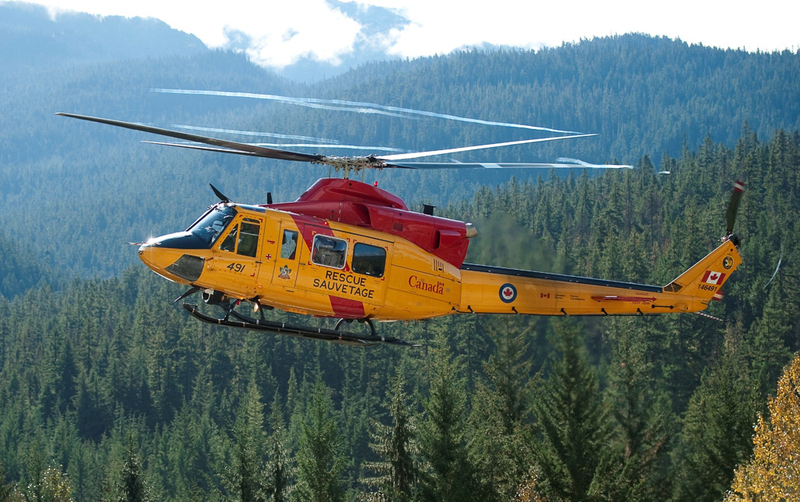 The CH-146 Griffon is a modified version of the Bell 421HP and has been in service as a primary SAR asset with 424 Squadron since 2005. Since 95% of the missions it is tasked to participate in take place in the southern part of the TSRR, its 656km (405m) range doesn’t usually present a major hurdle. 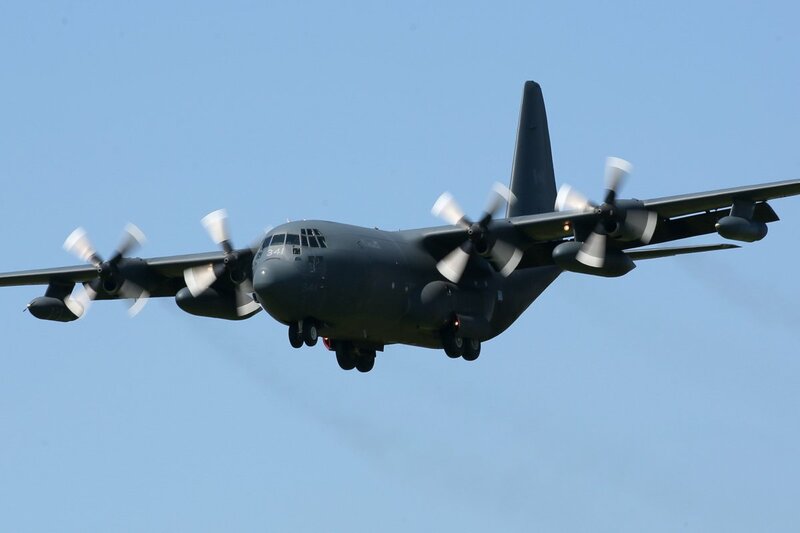 However, one of the advantages of being paired with the CC-130 Hercules on SAR missions is that if the Griffon needs to reach a distant search location, it can be loaded on to the Hercules and transported with a minimum of disassembly. 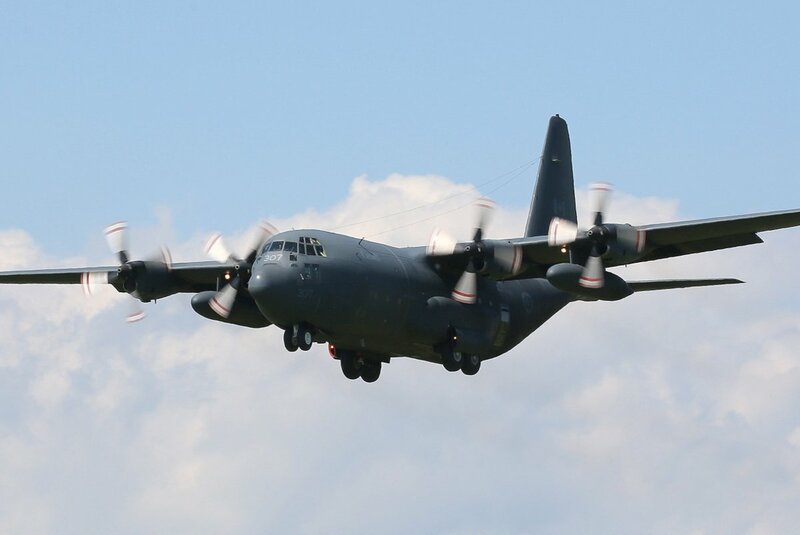 Currently, 424 TRS Squadron has four Lockheed CC-130H Hercules transports in its inventory. The RCAF has had the four-engine fixed-wing turboprop CC-130 Hercules in its inventory since 1960 and it has proven to be a dependable workhorse in a wide range of missions. Currently, 424 Squadron has four Hercules, all of which can be tasked and equipped for tactical transport or SAR missions. 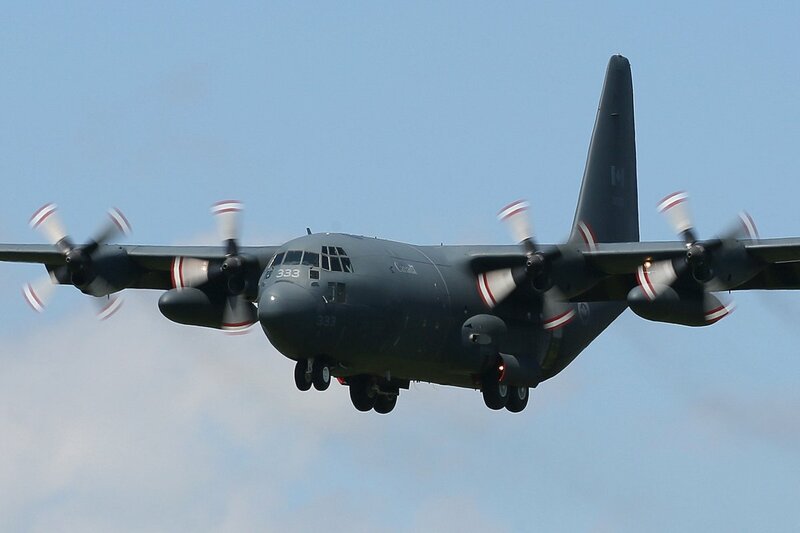 The Hercules has a maximum range of 7,222 km (4,488 miles), a cruising speed of 556 km per hour (345 miles per hour) and is capable of short takeoffs and landings (STOL) on unprepared runways. It can respond to SAR emergencies on almost any terrain and under the most challenging weather conditions. 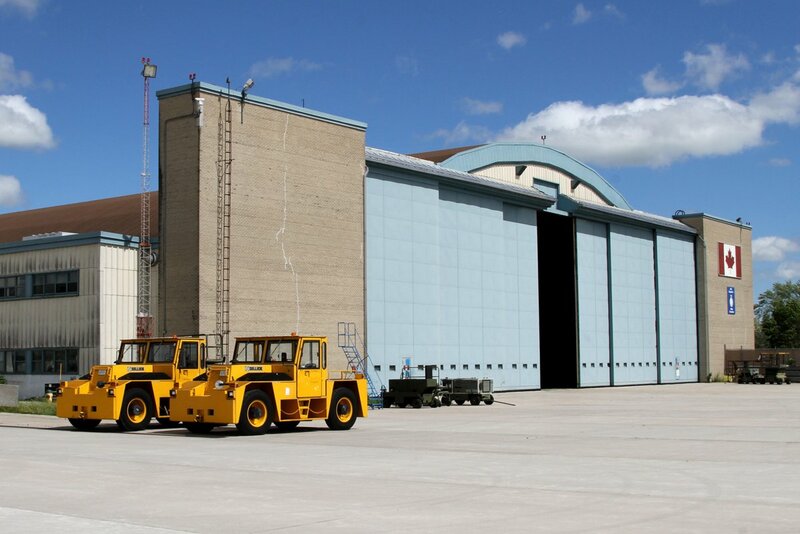 Operational activities occur all day long in Hangar 9 with briefings taking place daily. The detailed weather briefing, that APD attended, covered the entire Trenton Search and Rescue Region and gave a graphic illustration of how diverse the weather conditions can be when a flight crew is tasked for a mission within this massive area. Conditions ranged from un-stable weather in the Great Lakes, icing and turbulence in the north, and IFR conditions moving into the Arctic. 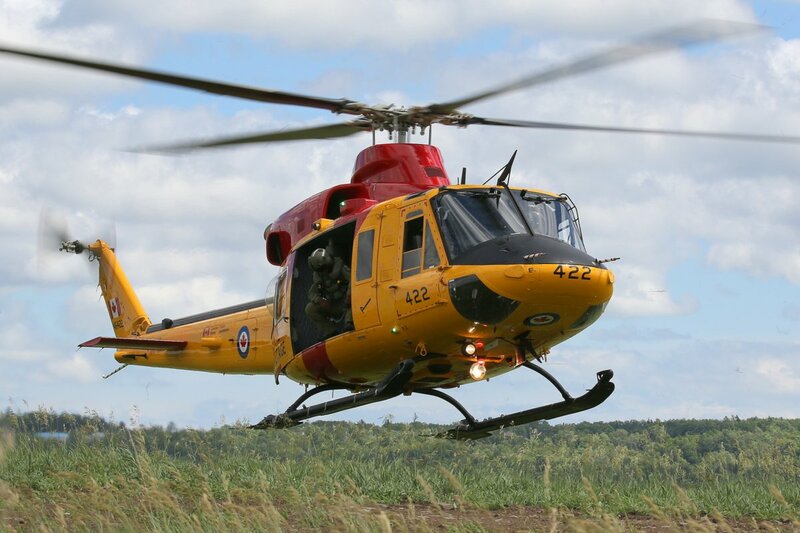 In his remarks, the CO noted that they had had six SAR taskings last week and, since the summer is the busiest time for 424 Squadron SAR missions, everyone should expect an increase in SAR activity as the summer progressed. 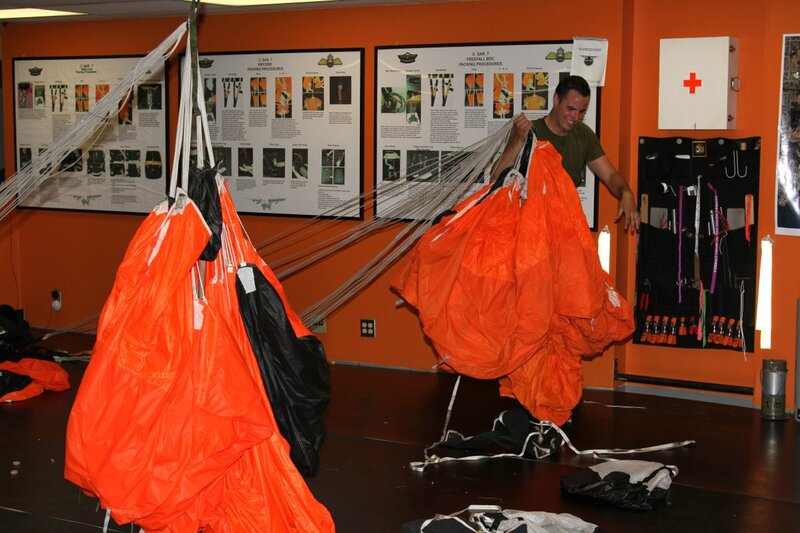 Rigorous-packed parachutes ready for the next mission. 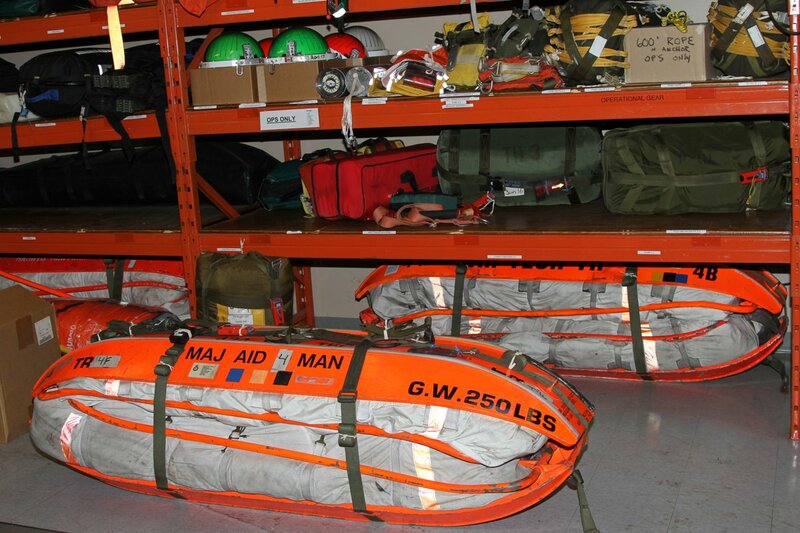 Repacked SAR kits ready for the next mission. 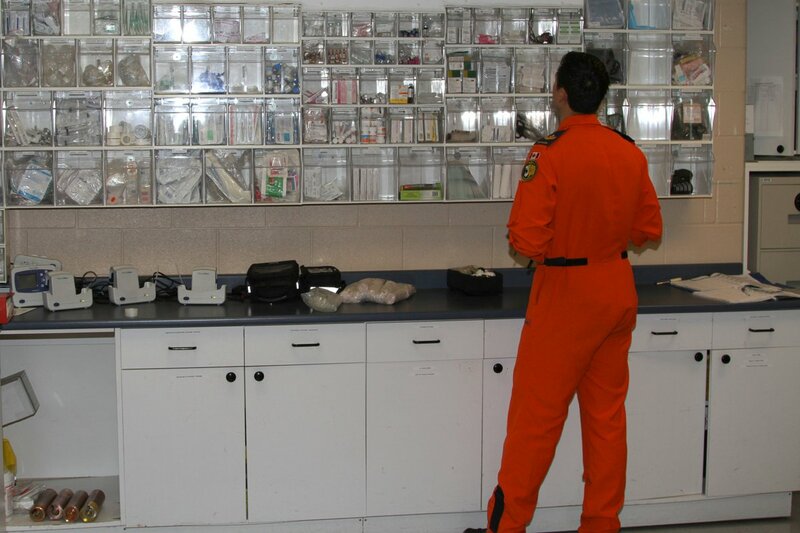 The SAR Medical Section contains a wide variety of drug, medicines and first aid equipment. 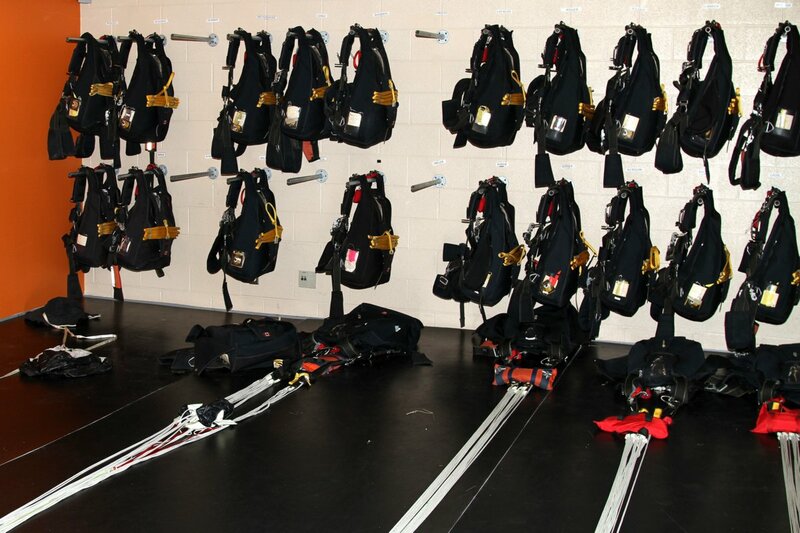 Each SAR Tech repacks their own training parachute. SAR Tech packing his training parachute. 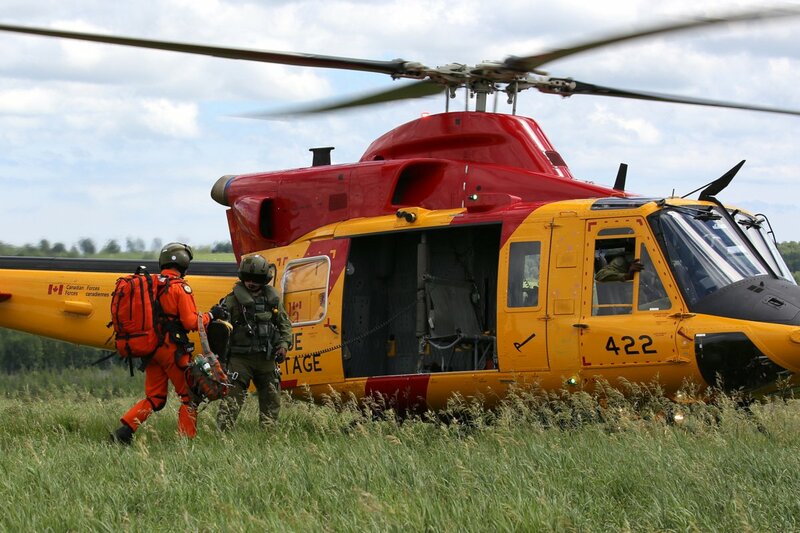 There are 140 men and women in the RCAF who are Canadian Forces Search and Rescue Technicians (SAR Techs) and 27 of them are attached to 424 Squadron. 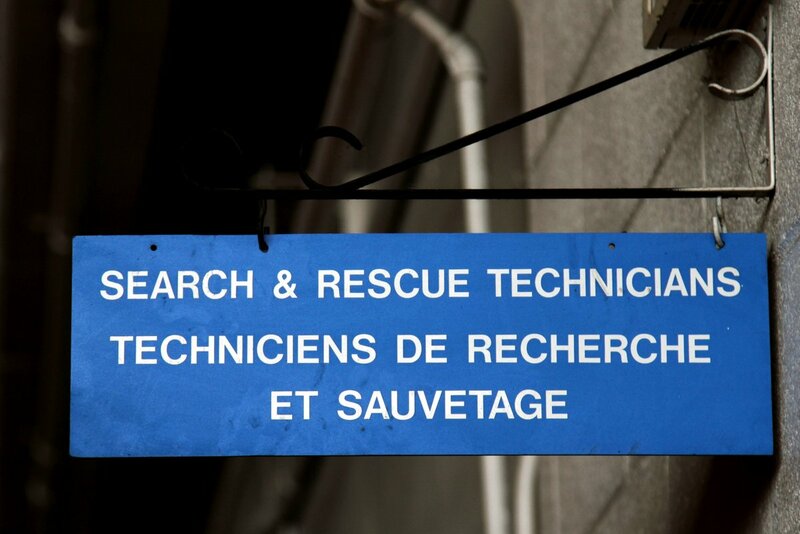 These highly trained rescue specialists have successfully completed a rigorous selection process and training program and are part of an elite group which has been dubbed as “the rescuers of last resort”. 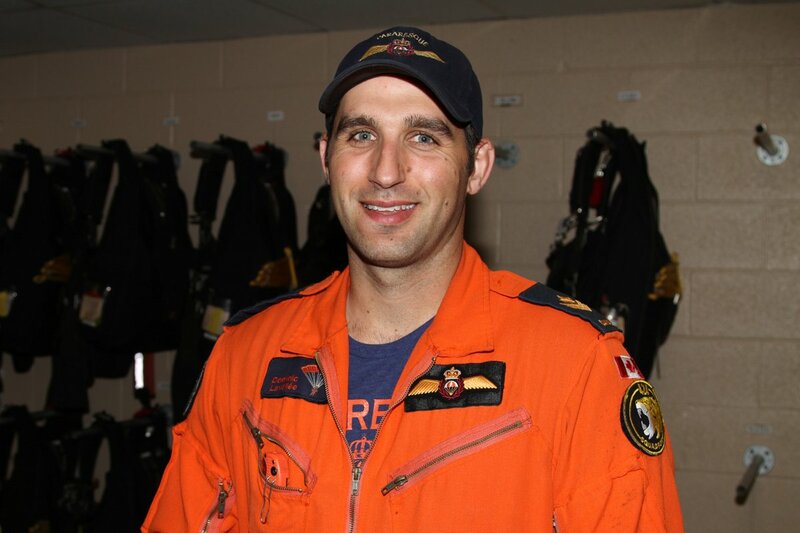 All are primary care paramedics, fully skilled in parachuting, mountaineering, survival, wilderness hiking, swimming, scuba diving and who provide on-scene medical aid and extraction in some of the harshest and most remote regions of Canada. They train to penetrate distress scenes in both land and water by parachute from the CC-130 or by hoist from the CH-146. The SAR Techs have their own area in Squadron 424’s Hangar 9 where they store and maintain all of their SAR equipment and SAR Tech MCpl Dominic Lavallee showed APD around this busy section. 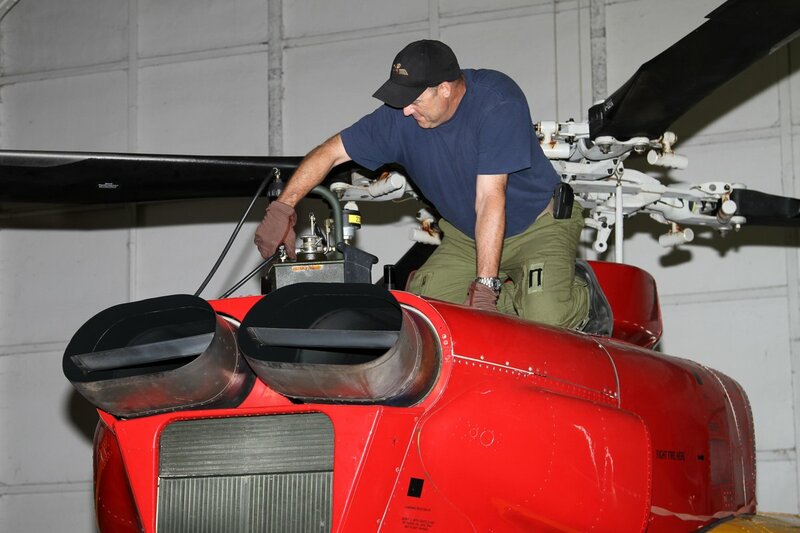 He explained that “As well as flying and keeping current, we do all of the maintenance of our equipment. When we bring a kit back after a mission, we re-stock it, re-build it, and put it back on the shelf ready for the next mission”. 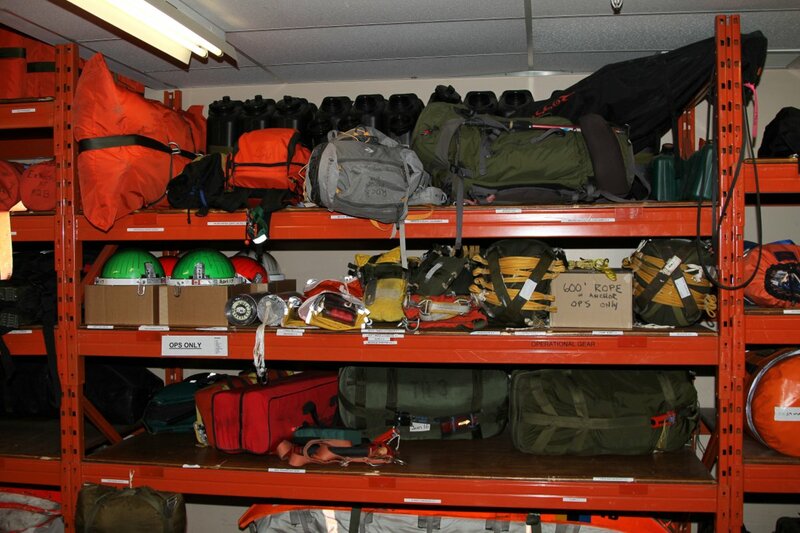 As we reached the para packing room, the MCpl continued “The SAR Techs pack their own parachutes which are actually training parachutes, although the larger parachutes we use on operations are rigorous packed for us”. 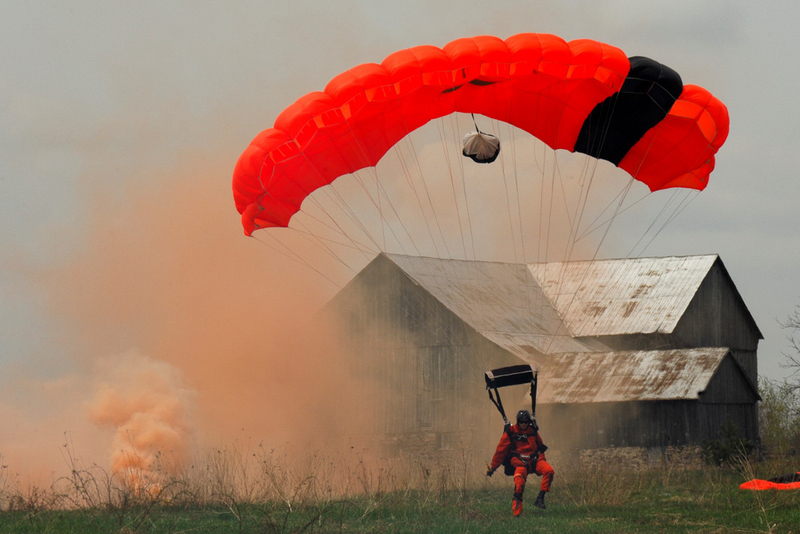 He went on to explain that the larger parachutes were required because, when they were tasked for a SAR penetration, they could be jumping with up to 200 lbs of equipment and kits. 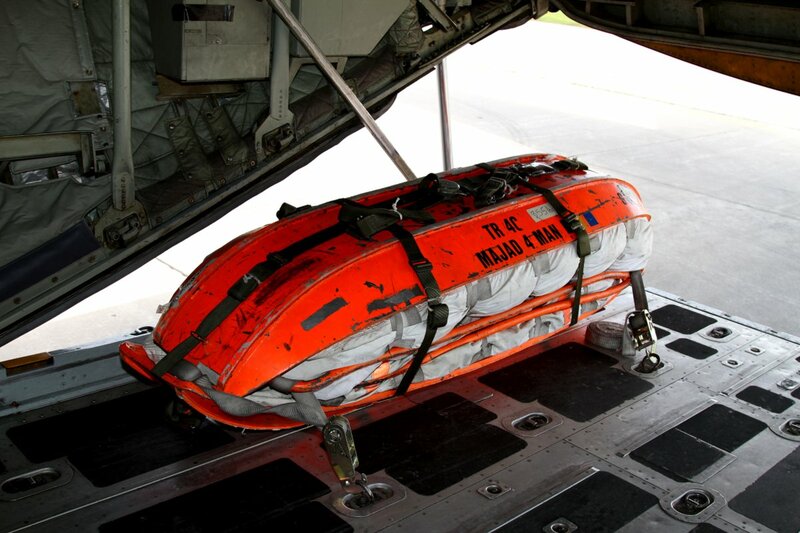 All SAR Techs are primary care medics who render on-site life-saving and sustaining medical care within established medical protocols and, after extraction, continue life-saving medical care during an evacuation to an appropriate medical facility. Therefore, their medical penetration kits contain all of the first aid items, drugs, and medical apparatus needed to complement this life-saving capability. After every mission, these medical kits are immediately checked and replenished from the stores in the medical section. 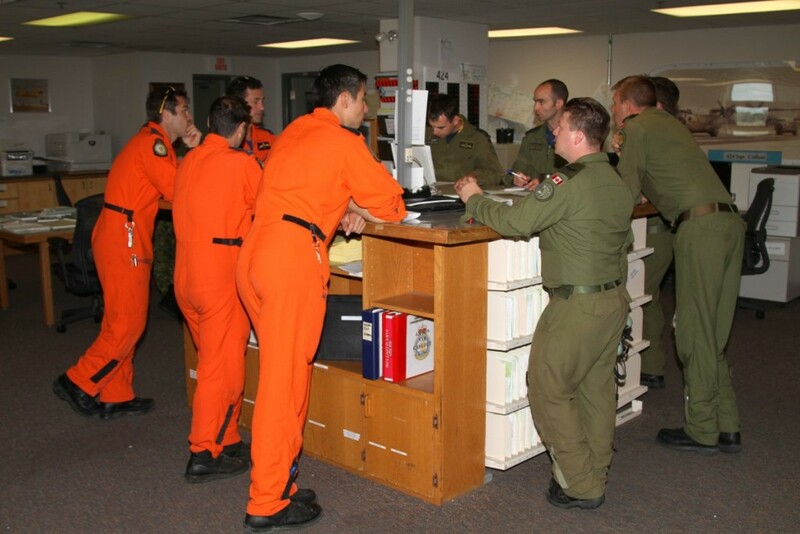 The flight and SAR Tech crews of Hercules Tiger 334 and Griffon Tiger 422 plan the afternoon’s training exercise. A SAR Tech training mission was planned for the afternoon so, after the weather briefing, the Hercules and Griffon crews involved met to review the exercise. 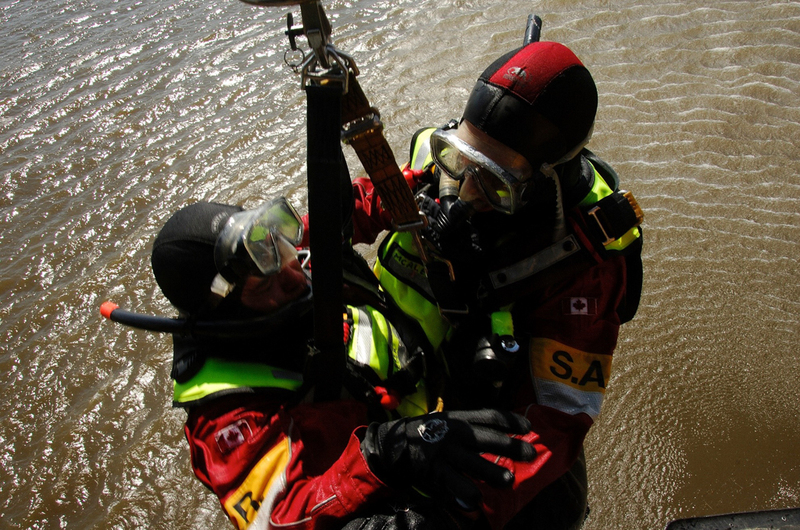 A water exercise had been planned for the SAR Techs to parachute into the Bay of Quinte and then have the Griffon extract them from the water with its hoist. Unfortunately as the high winds in the area had not abated, the exercise was moved to the land where the Griffon would drop off the SAR Techs and their equipment while the Hercules would fly top cover and then drop parachute bundles to the SAR Techs on the ground.. 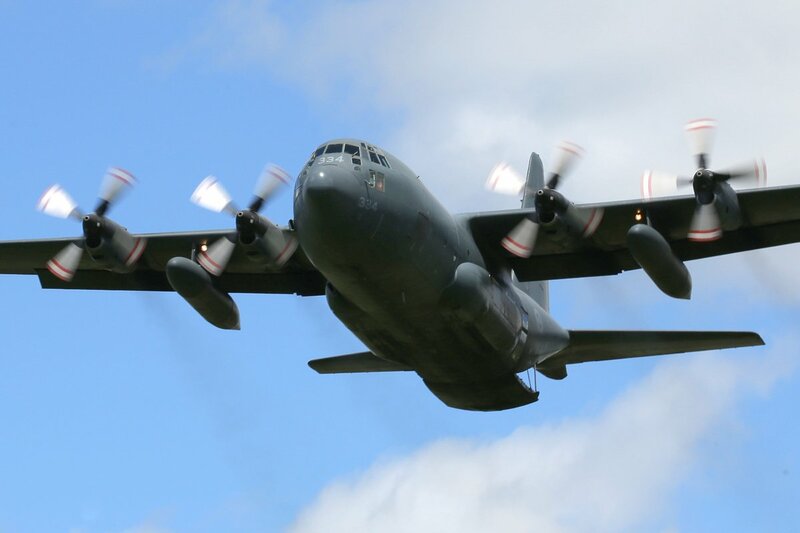 The plan was for the Hercules to be directed by the SAR Techs to vector in to their position at 300’AGL at a speed of 130Kts with 50% flaps, landing lights on and the rear ramp door open. 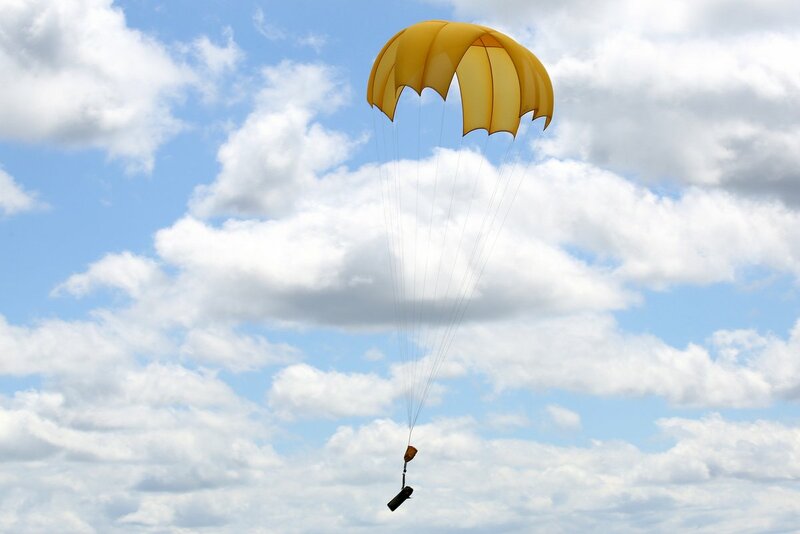 As APD observed, the SAR Hercules completed three drop passes; the first to drop a wind direction streamer and then each of the Message Bundle and Cargo parachutes. 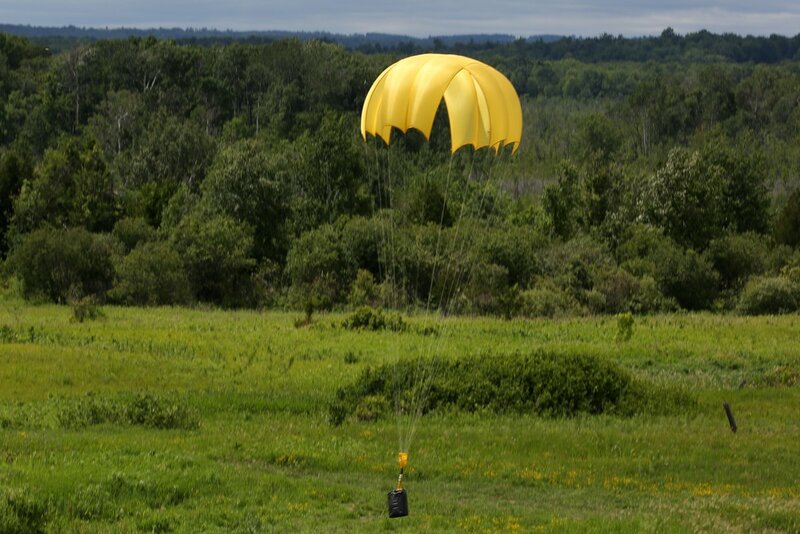 The Message Bundle dropped within 20 yards of the target and the cargo parachute within 40 yards. An impressive performance when considering that the winds that afternoon were blowing at over 35 kts! 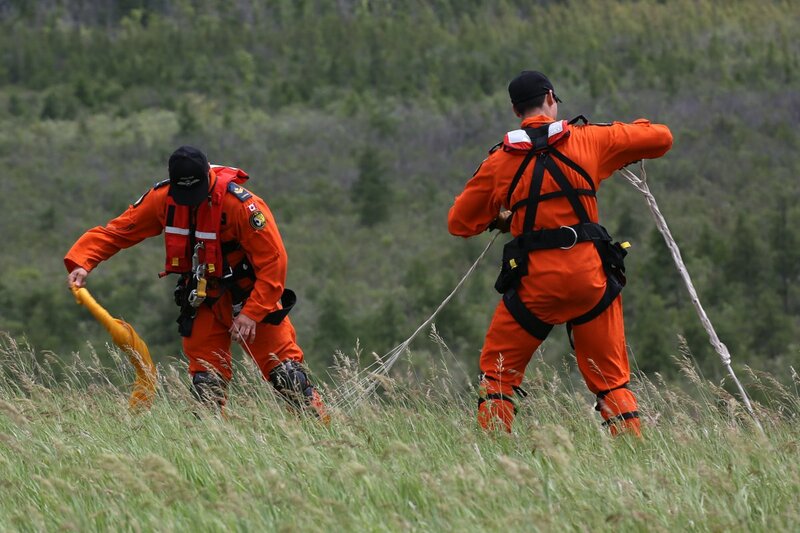 This particular training exercise has a high priority as many of the SAR response calls are for downed aircraft, lost individuals or powerless boats. The Message Bundle contains a loud screamer, a flare/marker and a radio which allows the person on the ground to report their condition to the first responder CC-130. 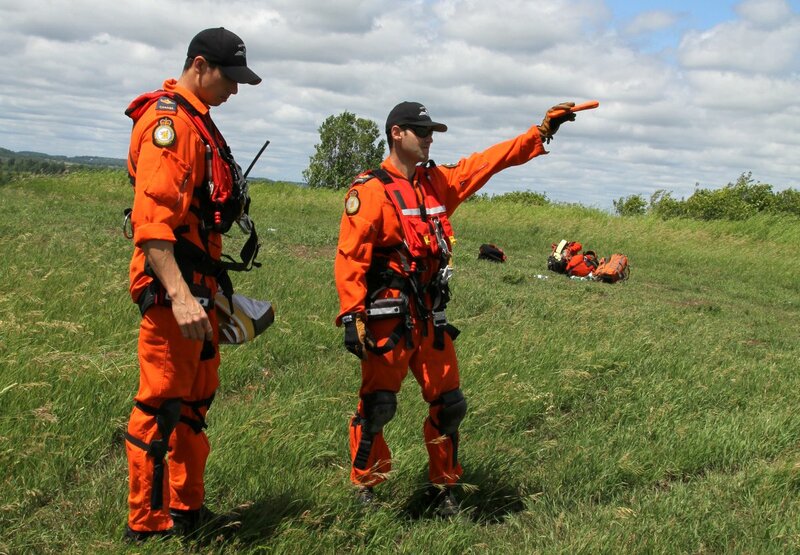 This, in turn, helps the SAR crew determine whether or not a pararescue action is required. Lockheed CC-130H Hercules Tiger 334 Cargo door open / dropping Message Bundle at SAR Tech training exercise. Message Bundle dropped by Lockheed CC-130H Hercules Tiger 334 at SAR Tech training exercise. 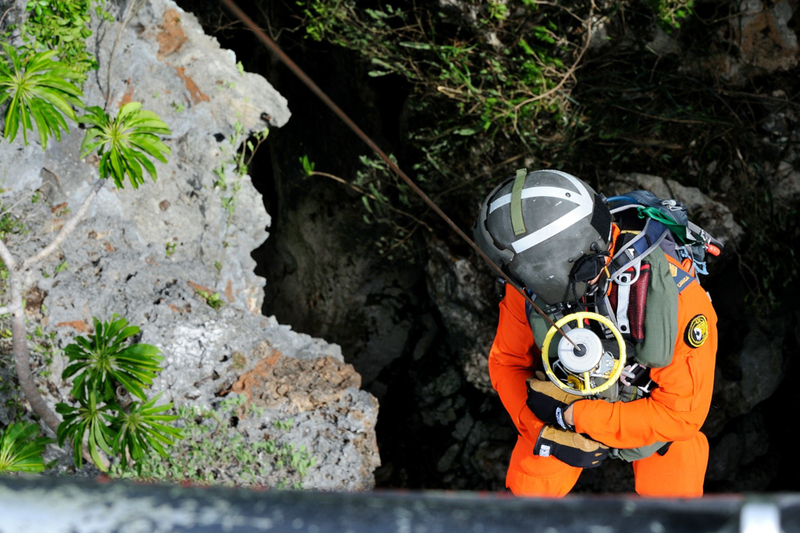 SAR Techs retrieving Message Bundle after drop from CC-130 Hercules Tiger 334. CC-130H Hercules Tiger 334 lining up to drop Gargo Bundle parachute. Cargo bundle dropped by CC-130 Hercules Tiger 334 at SAR Tech training exercise. Loading the CH-116 Griffon at end of SAR Tech training exercise. Bell CH-146 Griffon Tiger 422 Flight Engineer / Pre-flight inspection for SAR Tech training exercise. Bell CH-146 Griffon Tiger 422 flight deck. Bell CH-146 Griffon Tiger 422 landing at SAR Tech training site. Departure of CH-116 Griffon Tiger 422 fromSAR Tech training exercise landing zone. Message bundle containing a radio, smoke flare and screamer. SAR Techs guiding CC-130 Hercules Tiger 334 in for a Cargo Bundle parachute drop. 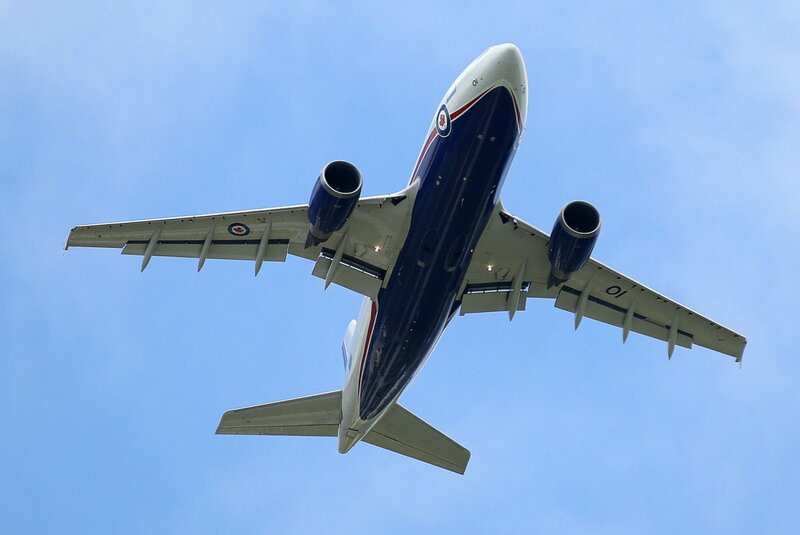 One of the problems that all air forces face with aging aircraft is that of keeping them at a high rate of mission readiness. Capt. Gayle Hartwig, a Hercules pilot and Griffon pilot Capt. Jean-Benoit Girard-Beauseigle, noted the challenge this objective created and discussed the issue with APD. They pointed out that both aircraft types in the squadron were achieving mid 90% readiness rates for their SAR missions. 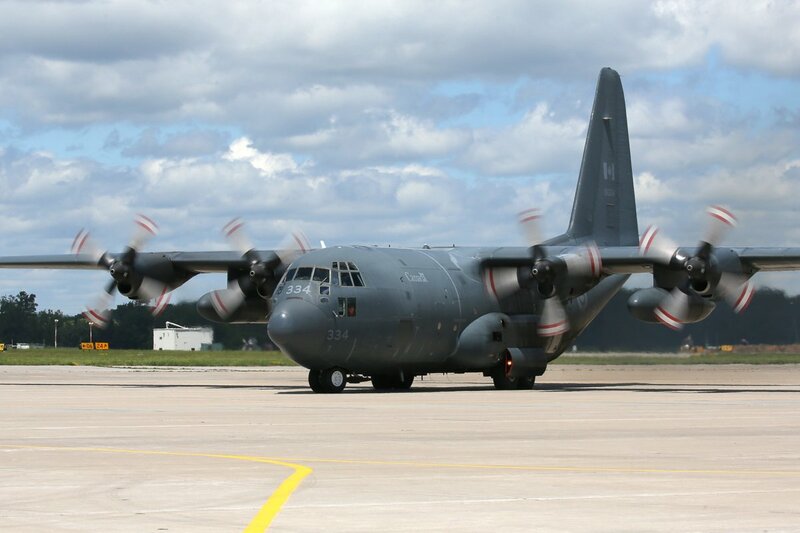 In particular, although the CC-130s were aging, each of them had received mid-life structural upgrades, new avionics and second-to-none maintenance that enabled them to meet operational demands. Both agreed that “The reason the squadron’s Hercules CC-130s and CH-146s are such reliable workhorses today is a testament to the professionals who service and maintain them”. Adding iol to the Pratt & Whitney PT6T-3D turboshaft engines. One of the squadron's Griffons taken out of service for maintenace. 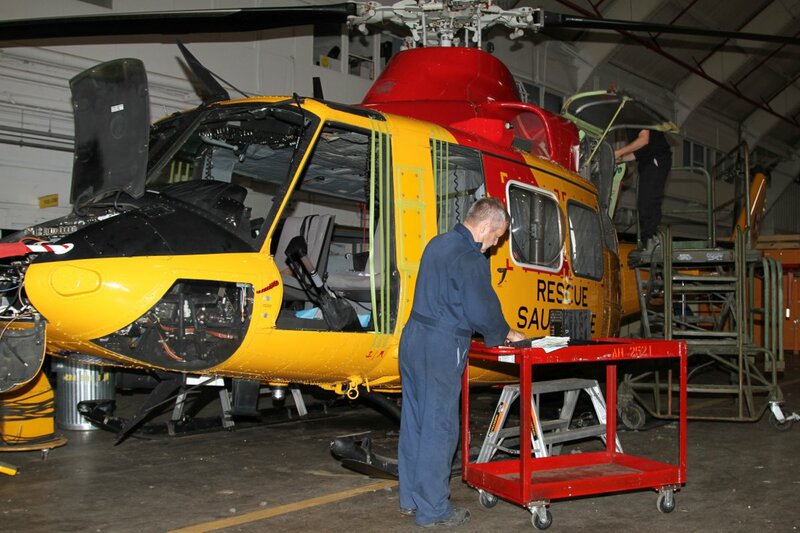 Maintenance of the avionics of the CH-146 Griffon. APD had a close inspection of CC-130H Hercules (130334) “Tiger 334” as it was being prepared for the afternoon SAR Tech training mission, and it was obvious that this particular aircraft had been configured for SAR operations. 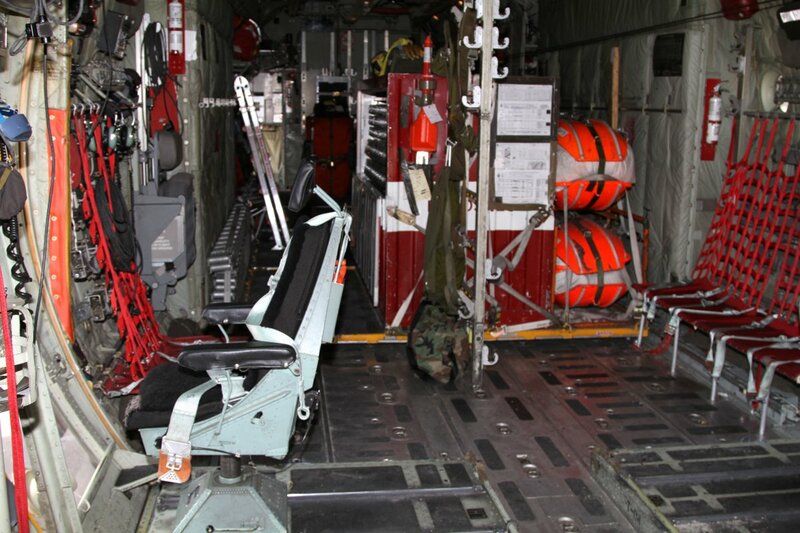 Loadmaster MCpl Mike Buggie called the cargo area “The business end of the aircraft” and pointed out the static line system, equipment containers and the special SAR door platforms for both the left and right pararescue door positions. 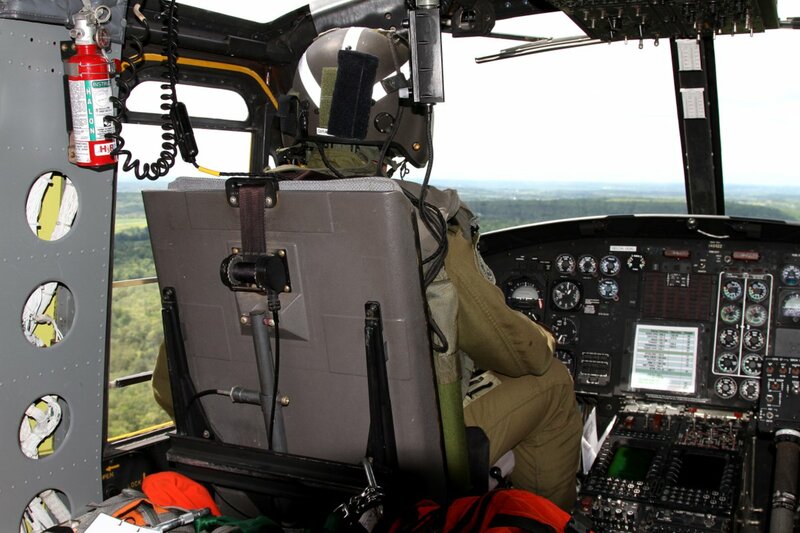 Each SAR door platform had an observation seat for spotters and an acrylic floor to ceiling window that was put in position on arrival at the rescue scene. 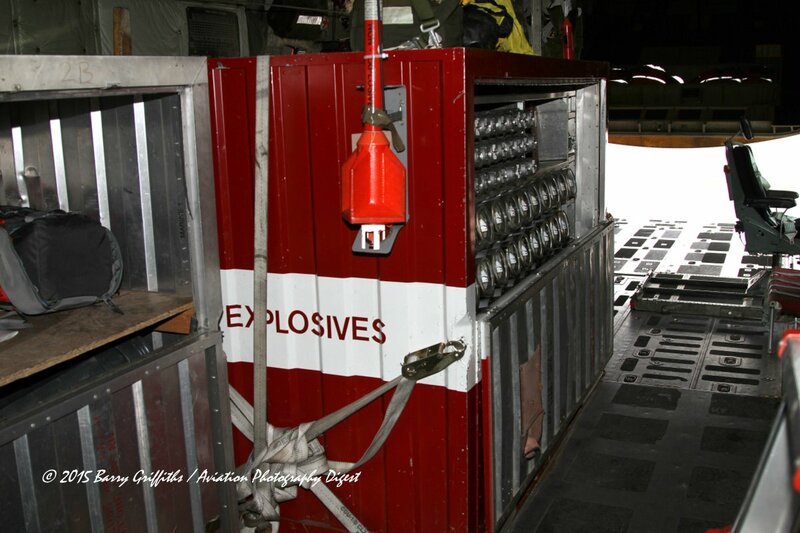 A large container, with a large “Explosives” sign painted on its side, was tightly anchored in the centre of the cargo hold and held a large number of pyrotechnics. MCpl. Buggie explained that these pyrotechnics were vital for SAR missions as “The CC-130 was usually first on the scene and, if it was a night mission, flares would be dropped to light up the target area for the SAR Tech jumpers. 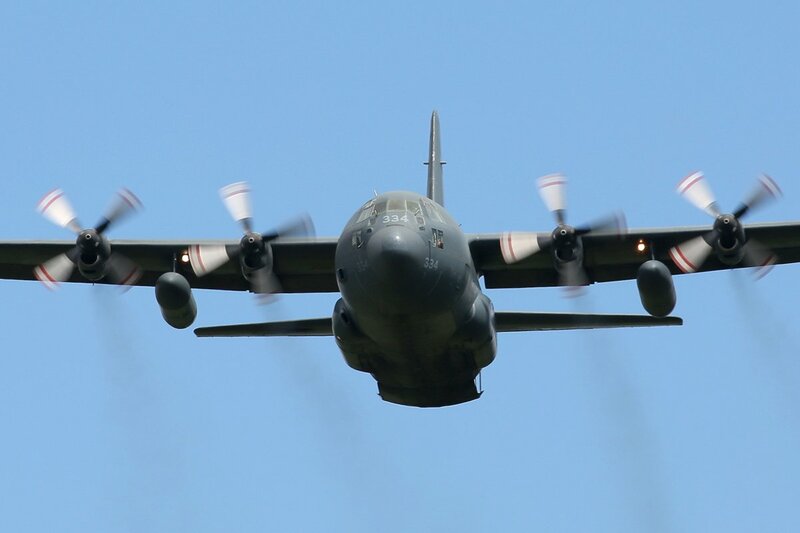 After this phase of the operation had been completed, and the SAR Techs safely inserted, the CC-130 would then fly top cover for the SAR helicopter and would drop bright night flares to ensure that it was able to operate close to the ground”. In addition, there were smaller marker beacons on board that react with water to produce flame and smoke to mark the targets. 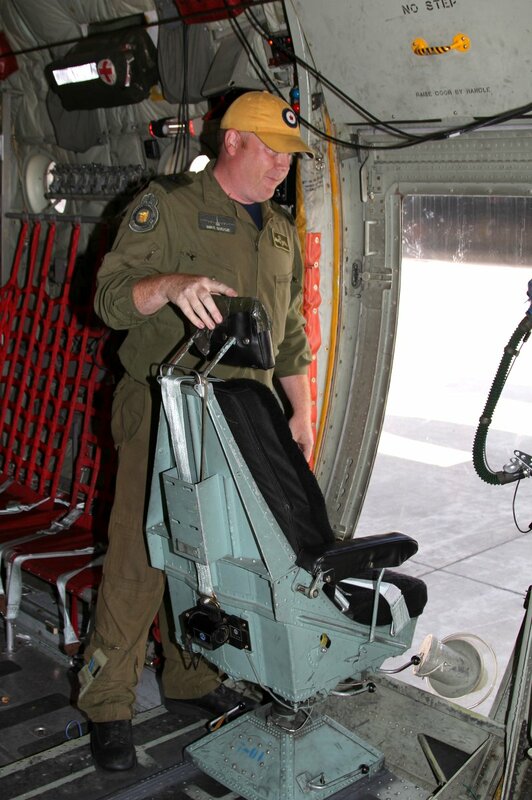 CC-130 Hercules Flight Engineer MCpl Mike Huggie at the starboard spotter position. Air droppable SAR Tech toboggan. 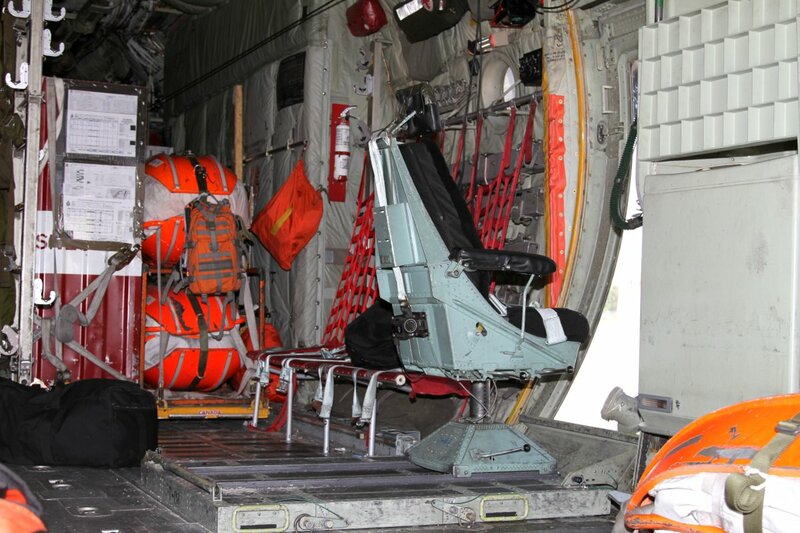 The cargo hold of the dedicated SAR Hercules is crammed with rescue equipment. 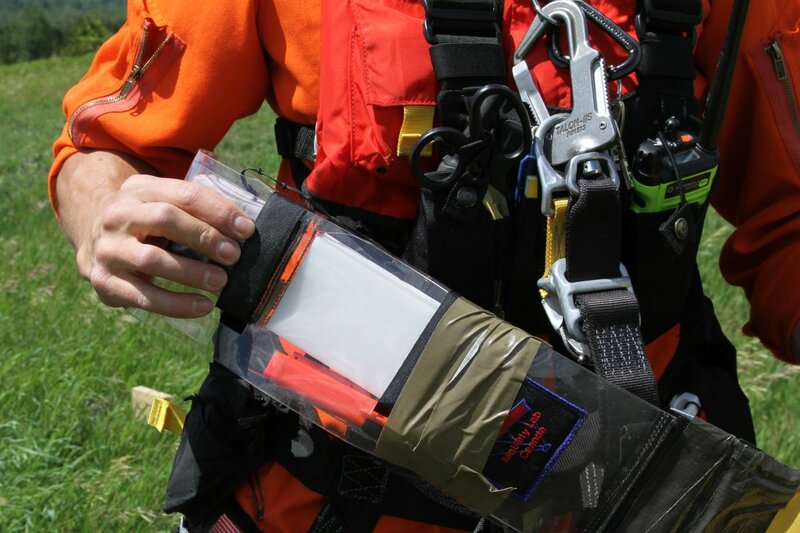 The explosives rack contains a large number of flares, and markers essential to a SAR mission. 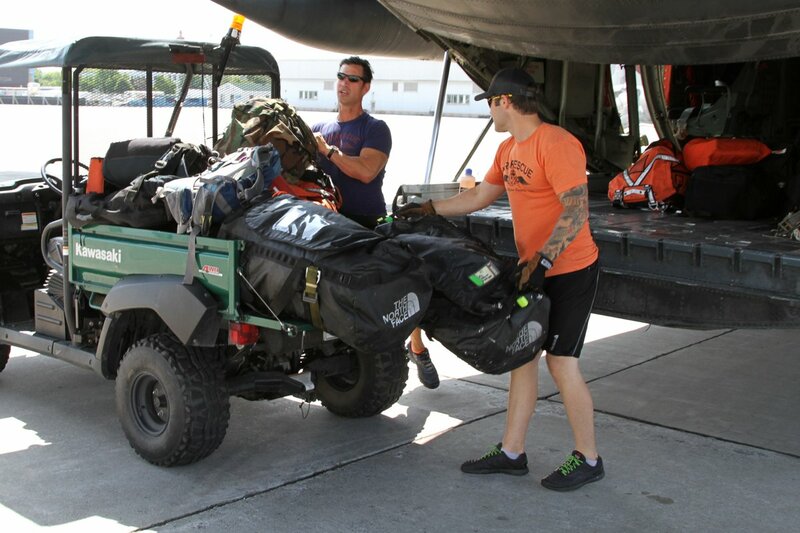 SAT Technicians load their gear into the CC-130 Hercules prior to their SAR training mission. 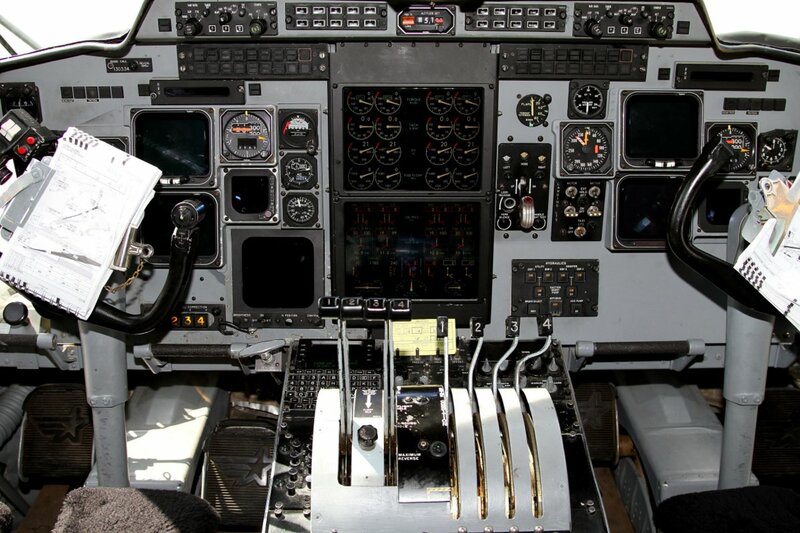 The flight deck of the CC-130H Hercules transport. 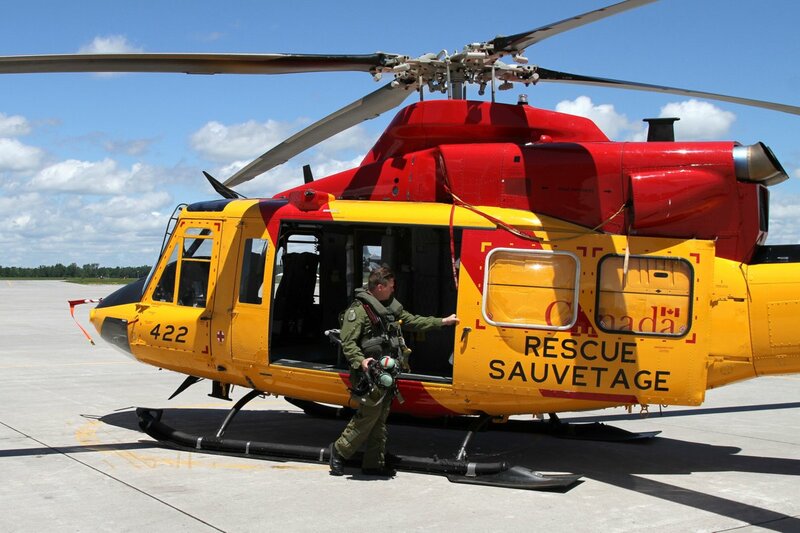 SAR crews always react immediately to a SAR incident once tasked by the JRCC and, when the aircrew are on base and the aircraft is ready to fly, they have 30 minutes to get airborne. When this happens, the squadron then places a second full crew on alert in the event of a long range mission where the first Hercules’ air crew may time out. 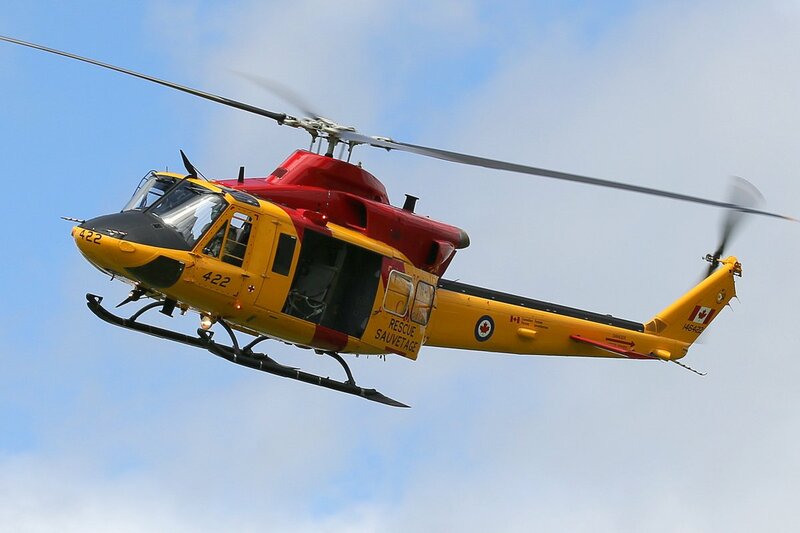 The necessity of having this policy in place was evident last year when 424 Squadron was involved in a particularly difficult rescue mission north of Lake Superior after a hiker had fallen into a very deep crevasse and had sustained serious back injuries. 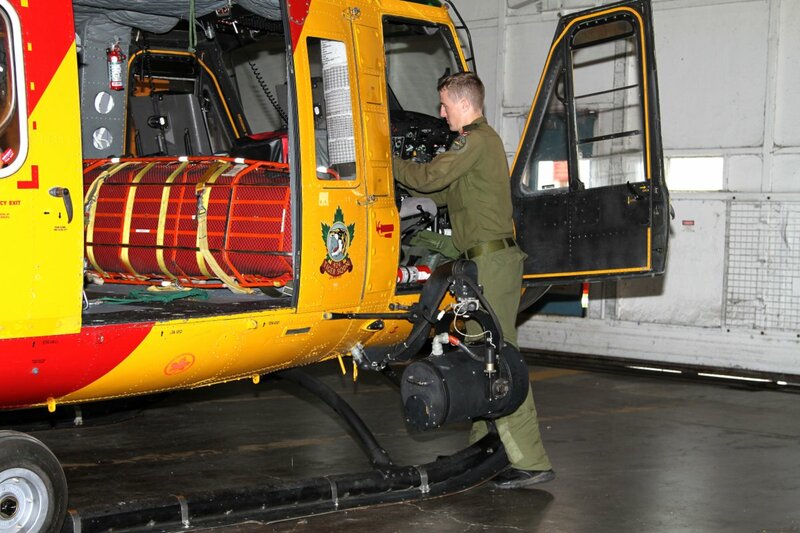 Since he couldn’t be moved, a hoist extraction seemed to be the only solution so JRCC Trenton tasked 424 Squadron with what was expected to be a night extraction mission by the CH-146 Griffon. The first response Hercules arrived on scene as it was getting dark and, knowing that the Griffon would not be arriving for at least another four hours, elected to have its two SAR Techs jump into the ravine to provide immediate medical assistance and to stabilize the casualty. When the Griffon arrived, the Hercules flew top cover and dropped night flares to illuminate the area while multiple attempts were made to initiate a hoist sequence. It was determined that because of the hazardous terrain and conditions that a rescue could not be safely conducted at night. Consequently, the Griffon dropped off its two SAR Techs on top of the ridge above the crevasse so they could rappel down the cliff face to provide additional assistance and care for the casualty throughout the night. The Hercules then dropped additional SAR equipment toboggans, containing food, tents, and extra supplies, to the site by parachute. 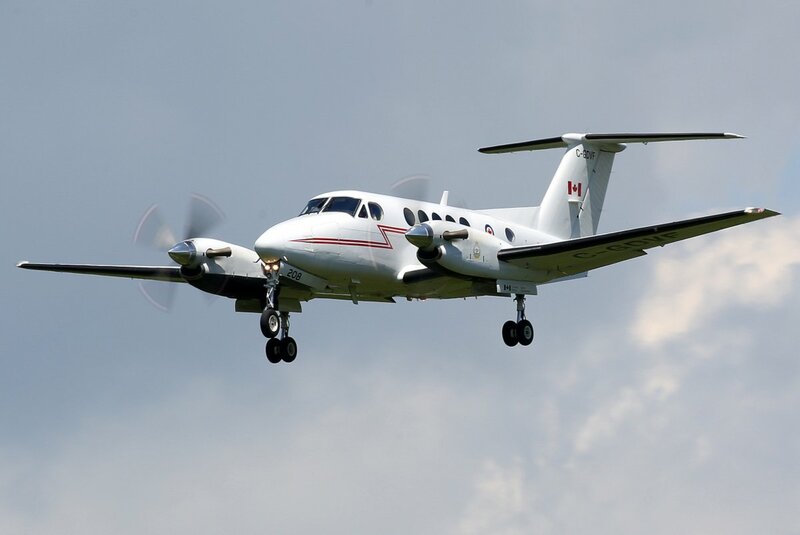 With four first response SAR Techs safely on the ground, and the flight crews exceeding their permitted on-mission hours, the two aircraft flew on to Sault Ste Marie for a mandated rest period. 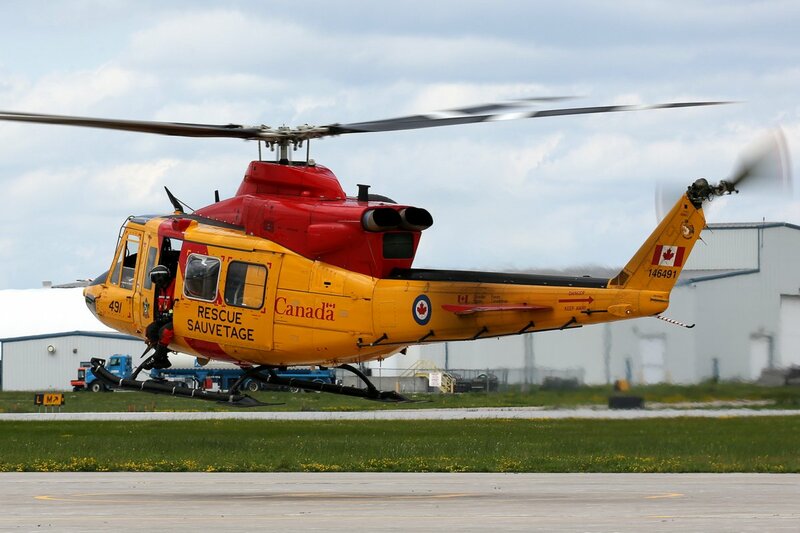 In the meantime, the second response SAR Hercules arrived from CFB Trenton to replace the first Hercules and flew top cover over the rescue site until daylight. 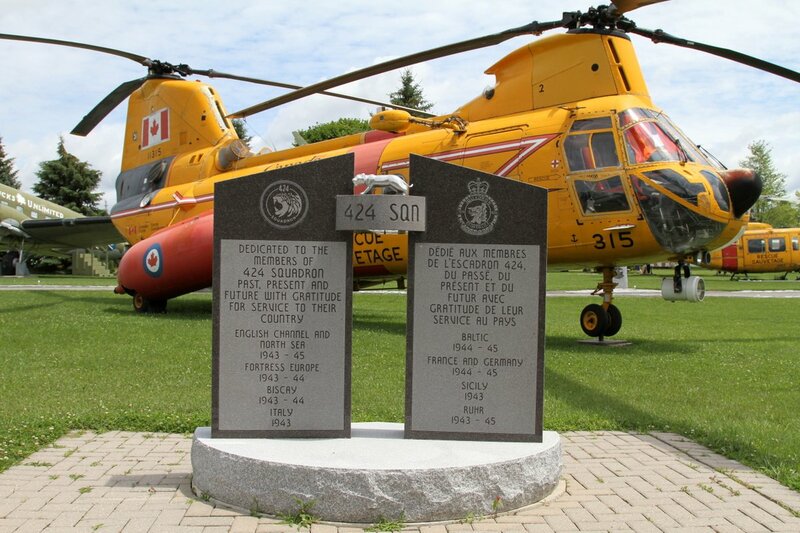 At 7:00am the next morning the Griffon returned from Sault Ste Marie, where the crew had overnighted, to successfully extract the casualty up over 200’ in what was among the highest Griffon hoists in recent 424 Squadron’s history. As this complicated rescue mission unfolded, the necessity of always having a second “fresh” crew available on standby ready for be activated and launched, was clearly apparent. Acknowledgements: Aviation Photography Digest would like to thank LCol Poitras, Capt Gayle Hartwig, Capt Jean-Benoit Girard-Beauseigle and members of 424 Tiger Squadron for taking the time to respond to our questions and Capt Andrea McKinley and Capt Chris Daniel of 8 Wing Public Affairs for all their assistance with this article. 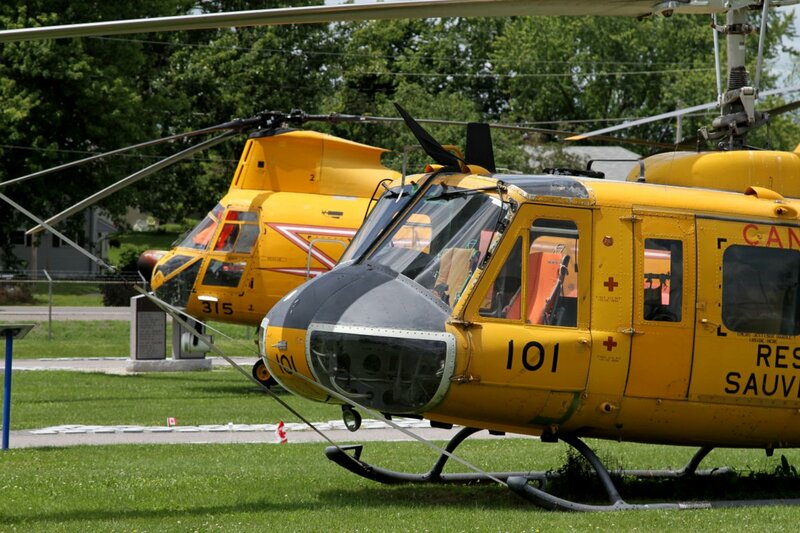 424 (Tiger) Squadron operates out of #9 Hangar at 8 Wing/CFB Trenton in its Transport and Rescue role. Alrt bird CH-146 Griffon SAR helicopter (Tiger 491) with a powerful Nitesun searchlight and SAR equipment.